The deep sea, the largest ecosystem on Earth and one of the least studied, harbours high biodiversity and provides a wealth of resources. Although humans have used the oceans for millennia, technological developments now allow exploitation of fisheries resources, hydrocarbons and minerals below 2000 m depth. 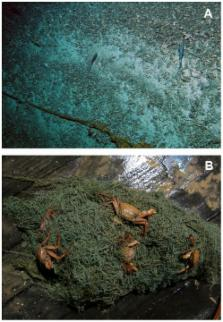 The remoteness of the deep seafloor has promoted the disposal of residues and litter. Ocean acidification and climate change now bring a new dimension of global effects. Thus the challenges facing the deep sea are large and accelerating, providing a new imperative for the science community, industry and national and international organizations to work together to develop successful exploitation management and conservation of the deep-sea ecosystem. This paper provides scientific expert judgement and a semi-quantitative analysis of past, present and future impacts of human-related activities on global deep-sea habitats within three categories: disposal, exploitation and climate change. The analysis is the result of a Census of Marine Life – SYNDEEP workshop (September 2008). A detailed review of known impacts and their effects is provided. The analysis shows how, in recent decades, the most significant anthropogenic activities that affect the deep sea have evolved from mainly disposal (past) to exploitation (present). We predict that from now and into the future, increases in atmospheric CO2 and facets and consequences of climate change will have the most impact on deep-sea habitats and their fauna. Synergies between different anthropogenic pressures and associated effects are discussed, indicating that most synergies are related to increased atmospheric CO2 and climate change effects. We identify deep-sea ecosystems we believe are at higher risk from human impacts in the near future: benthic communities on sedimentary upper slopes, cold-water corals, canyon benthic communities and seamount pelagic and benthic communities. We finalise this review with a short discussion on protection and management methods. The management and conservation of the world's oceans require synthesis of spatial data on the distribution and intensity of human activities and the overlap of their impacts on marine ecosystems. We developed an ecosystem-specific, multiscale spatial model to synthesize 17 global data sets of anthropogenic drivers of ecological change for 20 marine ecosystems. Our analysis indicates that no area is unaffected by human influence and that a large fraction (41%) is strongly affected by multiple drivers. However, large areas of relatively little human impact remain, particularly near the poles. The analytical process and resulting maps provide flexible tools for regional and global efforts to allocate conservation resources; to implement ecosystem-based management; and to inform marine spatial planning, education, and basic research. Anthropogenic ocean acidification over the twenty-first century and its impact on calcifying organisms. Today's surface ocean is saturated with respect to calcium carbonate, but increasing atmospheric carbon dioxide concentrations are reducing ocean pH and carbonate ion concentrations, and thus the level of calcium carbonate saturation. Experimental evidence suggests that if these trends continue, key marine organisms--such as corals and some plankton--will have difficulty maintaining their external calcium carbonate skeletons. Here we use 13 models of the ocean-carbon cycle to assess calcium carbonate saturation under the IS92a 'business-as-usual' scenario for future emissions of anthropogenic carbon dioxide. In our projections, Southern Ocean surface waters will begin to become undersaturated with respect to aragonite, a metastable form of calcium carbonate, by the year 2050. By 2100, this undersaturation could extend throughout the entire Southern Ocean and into the subarctic Pacific Ocean. When live pteropods were exposed to our predicted level of undersaturation during a two-day shipboard experiment, their aragonite shells showed notable dissolution. Our findings indicate that conditions detrimental to high-latitude ecosystems could develop within decades, not centuries as suggested previously. The oceanic sink for anthropogenic CO2. Using inorganic carbon measurements from an international survey effort in the 1990s and a tracer-based separation technique, we estimate a global oceanic anthropogenic carbon dioxide (CO2) sink for the period from 1800 to 1994 of 118 +/- 19 petagrams of carbon. The oceanic sink accounts for approximately 48% of the total fossil-fuel and cement-manufacturing emissions, implying that the terrestrial biosphere was a net source of CO2 to the atmosphere of about 39 +/- 28 petagrams of carbon for this period. The current fraction of total anthropogenic CO2 emissions stored in the ocean appears to be about one-third of the long-term potential. Conceived and designed the experiments: ERL PAT MCB OAB MRC EE LAL LM AAR CRS CLVD. Wrote the paper: ERL PAT MCB OAB MRC EE LAL LM AAR CRS CLVD. Copyright statement: Ramirez-Llodra et al. This is an open-access article distributed under the terms of the Creative Commons Attribution License, which permits unrestricted use, distribution, and reproduction in any medium, provided the original author and source are credited. Decline in coccolithophore diversity and impact on coccolith morphogenesis along a natural CO2 gradient.